Abstract: Owing to limited energy in wireless devices power saving is very critical to prolong the lifetime of the networks. In this regard, we designed a cross-layer optimization mechanism based on power control in which source node broadcasts a Route Request Packet (RREQ) containing information such as node id, image size, end to end bit error rate (BER) and residual battery energy to its neighbor nodes to initiate a multimedia session. Each intermediate node appends its remaining battery energy, link gain, node id and average noise power to the RREQ packet. Upon receiving the RREQ packets, the sink node finds node disjoint paths and calculates the optimal power vectors for each disjoint path using cross layer optimization algorithm. Sink based cross-layer maximal minimal residual energy (MMRE) algorithm finds the number of image packets that can be sent on each path and sends the Route Reply Packet (RREP) to the source on each disjoint path which contains the information such as optimal power vector, remaining battery energy vector and number of packets that can be sent on the path by the source. Simulation results indicate that considerable energy saving can be accomplished with the proposed cross layer power control algorithm. The TCP/IP protocol architecture for networking which is loosely based on the layered Open Systems Interconnection (ISO/OSI) architecture is a successful example for a very good architectural design. The entire networking task is divided into layers and each layer provides a set of services. Protocols can be designed to realize the services offered by various layers. Direct communication between two non-adjacent layers are prohibited by these architectures. Function calls and responses are used to communicate between two adjacent layers. It is imperative to design the protocols such that protocol in each layer only makes use of the services presented by the adjacent lower layer and never bothers about how these services are offered. The layered architecture incorporated in wireless networks was initially inherited from wired networks. Nonetheless, the research community started analyzing the aptness of the layered architecture as third and fourth generation wireless networks begin to proliferate in the area of communication networks. It is continually debated that layered architecture may not be well suited for wireless networks although they have functioned very well for wired networks . Therefore, to meet the challenges posed by the future wireless networks, it is imperative to design protocols by the layered architecture violation. This can be accomplished by permitting the protocols in the nonadjacent layers to directly communicate with each other (i.e., new interface creation between nonadjacent layers, variable sharing between layers, layer boundary refinement, protocol design at a layer based on the another layer details, joint parameter tuning across layers, and so on). This type of layered architecture violation has been called cross-layer design with regard to the reference architecture. One of the ways to perform energy efficient communication is by performing power and modulation control at the physical layer level. With regard to this, an adaptive modulation mechanism  for wireless sensor networks (WSN) with an additive white Gaussian noise (AWGN) channel is proposed. Link adaptation can be used to enhance the performance of WSN by saving the considerable amount of energy. The results given in  confirm that the link adaptation can improve the performance of WSNs. Furthermore, energy efficiency can be accomplished by suitably choosing a MAC layer protocol. Duty cycling  can be considered as one of the important methods for obtaining energy efficiency in energy constrained wireless networks. In this method, every wireless node periodically transits between an active state and a sleep state. Sum of its sleep time and the active time gives the duty cycle period. It is very important to consider the routing problems in energy constrained wireless network design. An important objective of a good routing protocol is to select energy efficient paths. Hence, it is imperative to develop energy efficient protocols by combining cross layer and energy aware system design. Plethora of routing protocols have been developed for WSNs and detailed in . Liu et al. proposed maximum minimum residual energy-ad hoc on demand multipath distance vector (MMRE-AOMDV) routing protocol which aims at balancing the traffic load amongst different nodes according to the remaining battery energy. This helps in prolonging the individual node’s lifetime and therefore the lifetime of the entire system. Firstly, the protocol finds the minimal nodal residual energy of each route from the source to destination and then sorts multiple available routes by descending minimal nodal residual energy. It selects the maximal minimal residual energy path for the data transmission at any point of time. The algorithm can prolong the network lifetime by balancing the battery power utilization of individual nodes. Simulation results show that the MMRE-AOMDV protocol outperforms AOMDV protocol. The authors in  considered joint routing and sleep scheduling to maximize the life time of WSN. Semchedine et al. proposed an energy efficient cross layer protocol (EECP) in which they considered physical, MAC and network layers for the routing. Using physical layer information, protocol routes the data to the node that has the maximum energy and closest to the sink. The MAC layer is used to determine the duty-cycle of the node and extend the sleep mode time. Chilamkurti et al. , proposed a cross-layer protocol that extends dynamic source routing (DSR) to enhance the energy efficiency by minimizing the frequency of recomputed routes. Iqbal et al. proposed an adaptive cross-layer multipath routing protocol which takes into account of the type of applications during the operation. The authors in  proposed the cross-layer image transmission algorithm which aims at minimizing the total energy consumption while transmitting the image over a given distance. To achieve this, the algorithm optimizes the transmit power and packet length by using image quality constraint specified by the application layer. The authors in  proposed a power aware medium access control (PAMAC) protocol. Here the network layer selects the path which requires the minimal total power amongst multiple possible paths under the condition that all the nodes belonging to the path should have battery capacity above a threshold. The authors in  proposed an efficient cross-layer protocol for WMSN between the MAC and network layer in which a cluster based multipath routing protocol is pursued in conjunction with an adaptive QoS aware scheduling. A cross-layer optimization protocol intended for MANET, in which the network layer dynamically adjusts its routing protocol by considering the signal to noise ratio (SNR) and received power along the end to end routing path for every transmission link was proposed by the authors in . Objective of this work is to develop the cross layer protocol between physical and network layer in the energy constrained wireless networks to minimize the total transmission energy while meeting the total end-to-end bit error rate (BER) for the image delivery using Castalia simulator. Scope is to maximize the lifetime of the battery operated wireless nodes. The research paper is organized as follows: Section 2 gives the necessary theoretical background required to understand the cross layer optimization algorithm. Section 3 gives the proposed cross-layer algorithm. Network model is discussed in Section 4. Results are tabulated and discussed in Section 5. Conclusions are drawn in Section 6. To design and implement the proposed cross layer model, a two-dimensional square region is considered to randomly deploy a given number of nodes. The packet carrying multimedia data is transmitted over a route with multiple intermediate hops. It is imperative to deliver the multimedia packet to the sink node with a minimum end-to-end BER. Each hop is modeled by a path-loss AWGN channel, so that channel gain gi has one to one relationship with hop length di. where gi is the link gain. where the transmission energy Ei is calculated by taking the product of transmission power PTx,i and the packet transmission time TR. The proposed cross layer algorithm  is depicted in Fig. 1. The algorithm is run in the sink node which is presumed to have large computational power and copious energy. Whenever source node intends to establish a session with the sink node, it broadcasts a Route Request Packet (RREQ) packet with node id, image size (m), residual energy (Eresidual) and end-to-end BER to its neighbor nodes. Upon receiving the RREQ packet, intermediate node appends its remaining battery energy, link gain (gi), node id and average noise power (nj) to this RREQ packet. The sink node receives the RREQ packets from multiple paths and finds all the possible node disjoint paths using the path information available in RREQ packets. For the nodes belonging to each disjoint path, the sink also finds the optimal powers using the aforementioned constraint equation (Eq. (4)) so as to satisfy the end to end BER with minimal total energy consumption. Sink finds the difference between the residual battery energy and reserved energy of each node on the route. 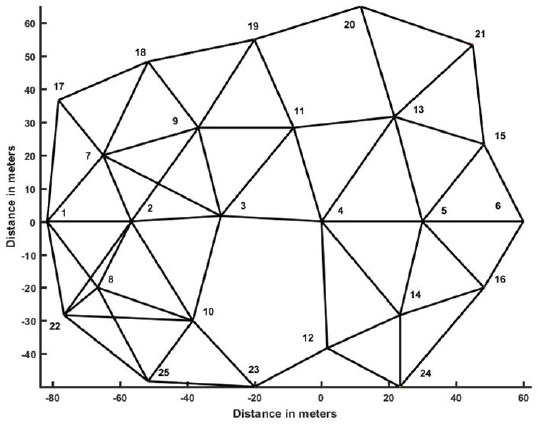 If these values are greater than optimal energies then the routes are marked as active routes. With the presumption that the initial energies of the nodes is the same, it can be argued that the path which consumes the minimal total energy is the winner. On the other hand, if we presume that the initial nodal energies are not same, it is necessary to extend the lifetimes of the nodes with least residual energy. Typically, the nodes which are at the vicinity of the sink nodes have least residual battery energy since they have been used by most of the traffic destined for the sink. It is required to enhance the lifetime of the nodes with minimal residual energy to enhance the network lifetime. This is ensured by sink-based MMRE algorithm. After computing the optimal powers, the sink finds the total number of packets that can be sent on each disjoint path by the source node using sink-based MMRE algorithm. Sink calculates the minimal residual energy for each disjoint path using the optimal powers. Packet counter corresponding to the path with maximum of minimal residual energies is incremented by one. For every node on the maximum minimal residual energy path, the residual battery energy is updated by subtracting the packet transmission energy from the current residual energy. The whole procedure is reiterated until the total packet counter on all the disjoint paths reaches the number of application packets. The sink sends back Route Reply Packets (RREP) to the source node through each disjoint path with information such as optimal power corresponding to each node, updated residual battery energy of each node and the packet counter for the path. 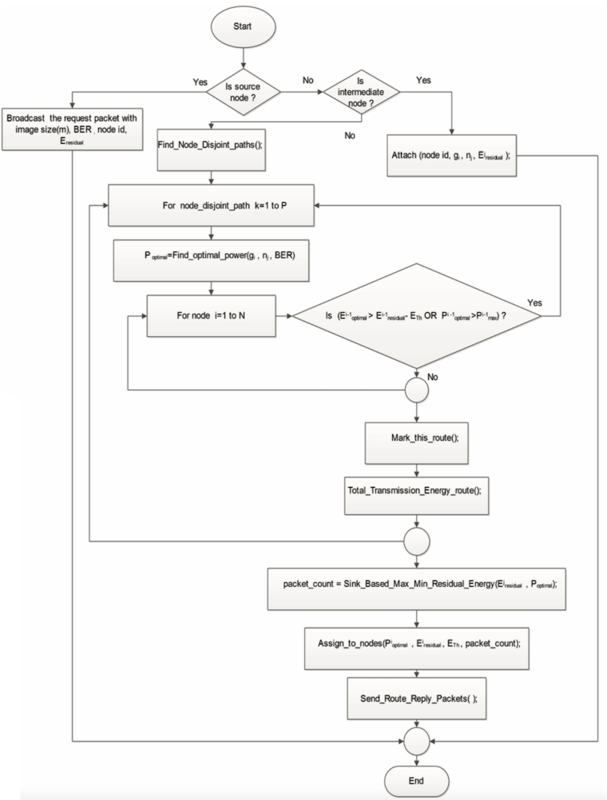 Flowchart for the sink-based cross layer MMRE multipath routing algorithm. The proposed algorithm is implemented in Castalia simulator which is built on famous event driven simulator OMNET++. Though the proposed cross layer model was implemented in MATLAB , to perform the objective and subjective quality assessment of the image received at the sink, it is required to create a network scenario. The Castalia simulator is selected for this purpose, since a network simulator based on MATLAB is not available. Moreover, the fact that Castalia simulator supports 8- discrete power levels can be exploited to perform the intended cross layer power control. The nodes configure themselves with the optimal discrete powers available in the RREQ packets sent from the sink node. The discrete power levels supported by Castalia are tabulated in Table 1. As depicted in Fig. 2, 25 sensors with maximum transmission power of 57.42 mW (i.e., the maximum power supported by Castalia) were randomly deployed on 150 m × 150 m two-dimensional square region. Each node can communicate with the nodes in its transmission range which is depicted using edges in the Fig. 2. Node-1 acts as multimedia source node and Node-6 acts as sink node which is assumed to have abundant energy and computational power. In this work, disjoint paths with least delays are selected. The sink node stores the first RREQ by default. Subsequent RREQ packets are stored, if the path information available in these RREQ packets are disjoint to the paths available in the already stored packets. Otherwise, packets are rejected. The following node disjoint paths are obtained after using this method. Path 3: [1 8 10 23 12 14 16 6]. Path 3: [3500 1800 1720 1620 1560 1480 1400]. The optimal power vectors calculated by the sink using the information available in the RREQ packets for the disjoint paths are tabulated in Tables 2–4 for various end-to-end BER. It can be seen that nodes are configured with one of the 8 optimal powers supported by Castalia. Since continuous power levels are not available in the simulator the optimal powers are rounded to the next discrete power levels which are greater than or equal to the calculated optimal power. A 512×512 color Lena image is packetized and transmitted with 28 bytes of application header per packet. Total number of packets and number of packets that can be transmitted on each path for different packet sizes and end to end BERs as reported by sink-based cross layer MMRE algorithm are tabulated in Table 5. For the simulation, data rate of 250 kbps is considered. The energy consumption per path for the transmission of image packets—with and without cross-layer power control (i.e., with maximum transmission power)—is shown in Table 6. As expected, the path energy increases with decrease in BER. The total energy consumption for the transmission of image packets—with and without cross layer power control (i.e., with maximum transmission power)—is shown in Table 7. As expected, the path energy increases with decrease in BER. It can also be seen that total energy decreases with increase in packet size due to the reduction in total number of application overhead bits. Total energy saving = Total energy consumption with Maximum power – Total energy consumption with cross layer power control. The lifetime of the network is proportional to the total number of packets that can be sent on all the active paths until one of the nodes on each active path drains the energy to threshold energy (ETh). For the purpose of simulation, threshold energy of 2 mJ is considered. Table 9 shows the number of packets that can be sent by sink-based cross layer MMRE multipath routing algorithm for various BERs and MMRE AOMDV (without cross layer) on all the active paths until one of the nodes on each active path drains the energy to ETh. Table 10 shows the percentage lifetime improvement for Sink based Cross Layer MMRE multipath routing algorithm over MMRE AOMDV (without cross layer) for various BERs. The image is reconstructed for subjective and objective quality analysis using ImageMagick software. ImageMagick is a software suite to create, edit, compose, or convert bitmap images. It can read and write images in a variety of formats. It runs on Linux, Windows, Mac OS X, iOS, Android OS, and others. ImageMagick is free software delivered as a ready-to-run binary distribution or as source code that we may use, copy, modify, and distribute in both open and proprietary applications. There are a number of interfaces to popular languages which could be explored from their website. We use Magick++, the C++ API for ImageMagick which provides all the ImageMagick functionalities at the command line and from programs written in C++. Magick++ API’s image class allows low-level image pixel access through its methods. With these methods we could reconstruct images from the data packets we receive, allowing only those pixels to be laid out on the image canvas. In the case of missing data packets, we use the same pixels pointed by the previously received data packets. 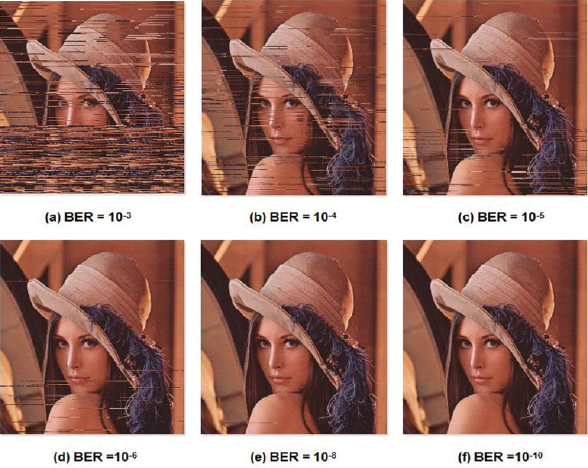 After reconstructing the received data packets, the images are compared with original images for objective and subjective quality analysis. The metric used for objective quality analysis is the peak signal to noise ratio (PSNR). Table 11 gives the variation of PSNR for packet sizes 128, 256, 512 bytes and six different BERs. We can see that PSNR is higher for smaller packet sizes and increases with decreasing BER. This is due to the increase in packet error rate with the increase in the packet size which in turn reduces the number of correctly received packets. Reconstructed images for subjective quality analysis are shown in Figs. 3–5 for various BERs and packet sizes. It can be seen that for the BER 10-3, perceptibility is very poor and hence this is the worst case scenario. 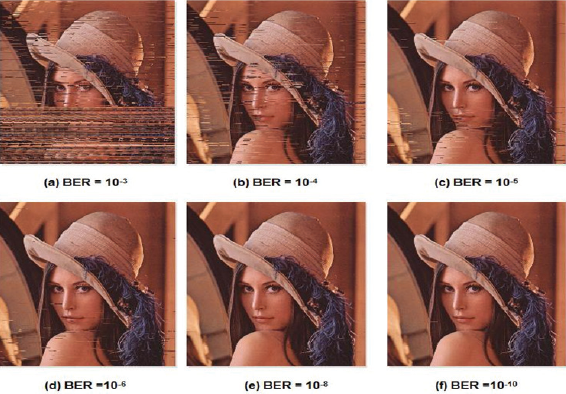 For the remaining BERs image is perceivable and the quality improvement can be noticed with the decrease in BER. Subjective quality analysis for packet size of 128 bytes. Subjective quality analysis for packet size of 256 bytes. Subjective quality analysis for packet size of 512 bytes. In this work, a cross-layer optimization model based on power control is developed for a sink based cross layer multipath routing protocol. 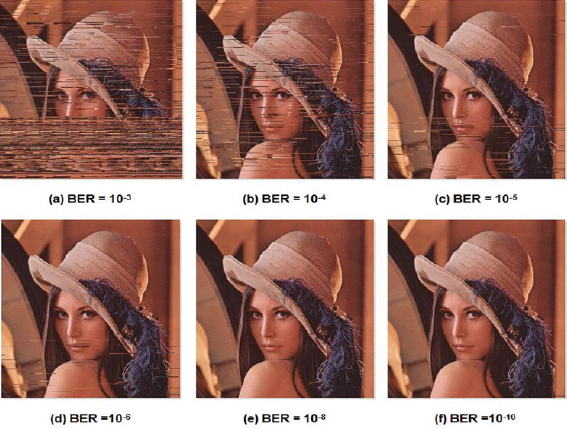 The optimization mechanism is subject to certain QoS requirements for the image transmission specified in terms of total end to end BER. The proposed Sink based Cross Layer MMRE multipath routing algorithm uses the cross layer information available in the RREQ packets to calculate the optimal power vectors and the number of packets that can be sent by the source for each disjoint path. Unlike the conventional MMRE AOMDV algorithm, the Sink based Cross Layer MMRE multipath routing algorithm pushes the task of finding the maximal minimal energy paths to the sink node which is assumed to have large computational power and abundant energy. Owing to this, source node is freed from complex algorithmic computation which requires copious energy. Furthermore, each packet is sent on the maximum minimal residual energy paths. This helps in balancing the energy consumption on multiple paths and hence helps in lifespan improvement of the network. The cross layer optimization algorithm is implemented using popular Castalia simulator and the results indicate that considerable energy savings and network lifespan enhancement can be accomplished. He received B.E. degree in Electronics and Communication Engineering and M.Tech degree in Digital Electronics and Advanced Communication from Mangalore University, India. He obtained his Ph.D. degree from Manipal University, Manipal in the area of Speech Processing. Since 1987, he has been with Manipal Institute of Technology, MAHE, Manipal, India, where he is currently working as Professor in the Department of Electronics and Communication Engineering. His research interests include Speech Processing, Digital Communication and Signal Processing. He has published many research papers in various journals and conferences. He received B.E. degree in Telecommunication from Visvesvaraya Technological University, Belgaum, India in 2012. He is currently pursuing Master of Technology in the Department of Information and Communication Technology, Manipal Institute of Technology, Manipal, India.